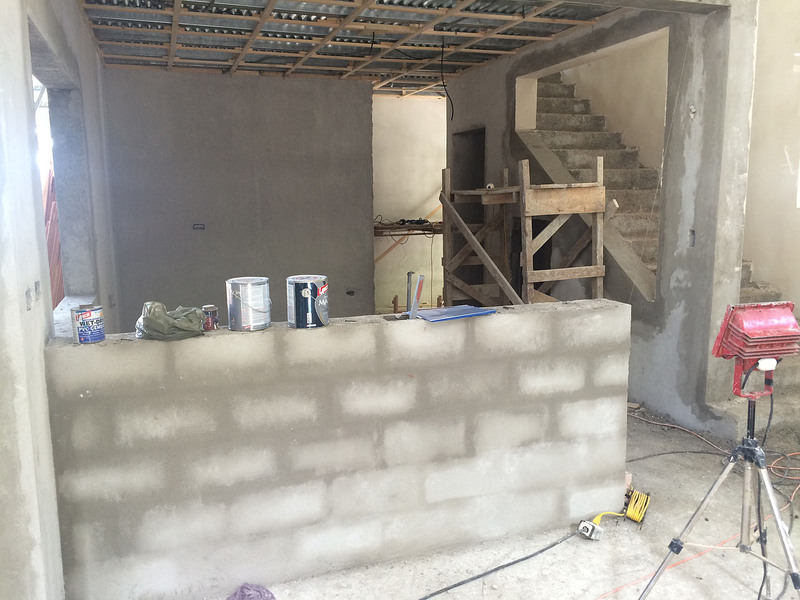 Our house is coming along nicely! Both Eddie and I are very pleased with the progress and the quality of the work. 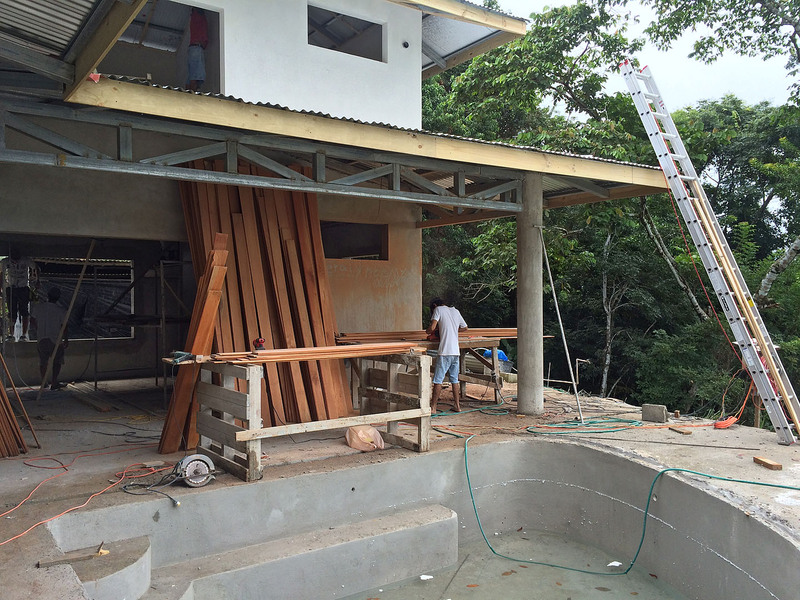 These past two weeks the guys have been working on leveling the interior floors and the pool deck, sanding the tablilla (wood paneling for the ceiling and under the outer roof), fixing the front entrance, and finishing up the windows and doors. The electrician’s crew have been doing more electrical work. The cabinetmaker who is going to make the kitchen cabinets, all the interior doors, front and side doors came by to measure the openings, and the window company stopped by to take their measurements as well. In addition, we have another cabinetmaker who will make the closet doors, bathroom cabinets, staircase railings and furniture for us. So, there has been a lot of activity at the house. 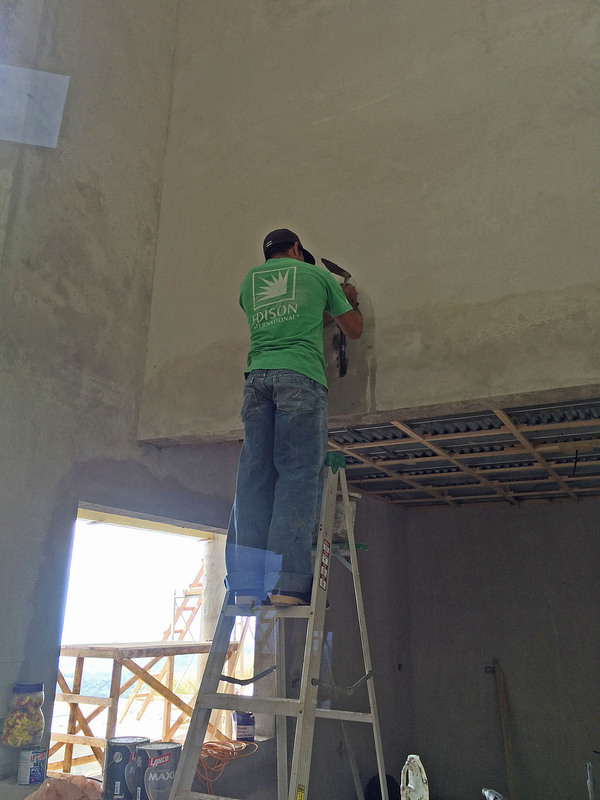 The wood for the ceilings is being sanded. 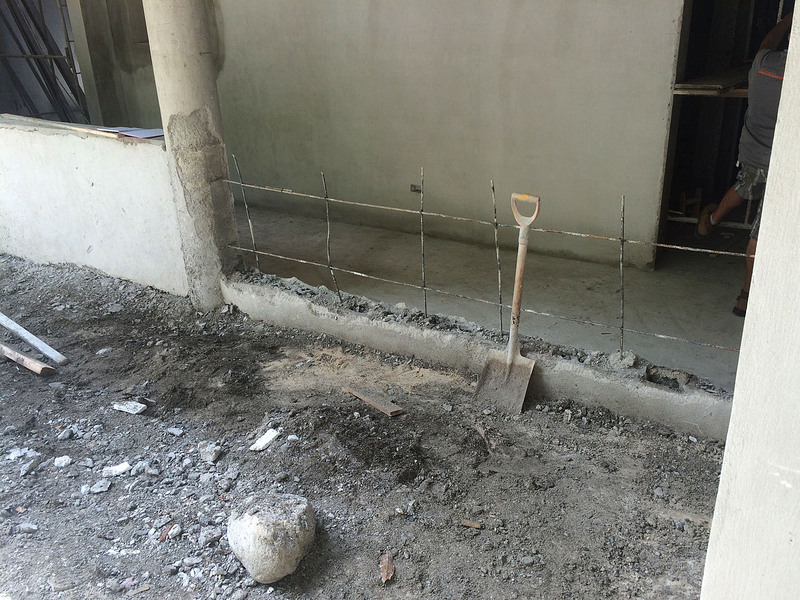 We had a portion of this half wall knocked out to improve the front entrance. The electrician is installing the electrical box for the pendant lights that will hang from the big wooden shelf over the bar. 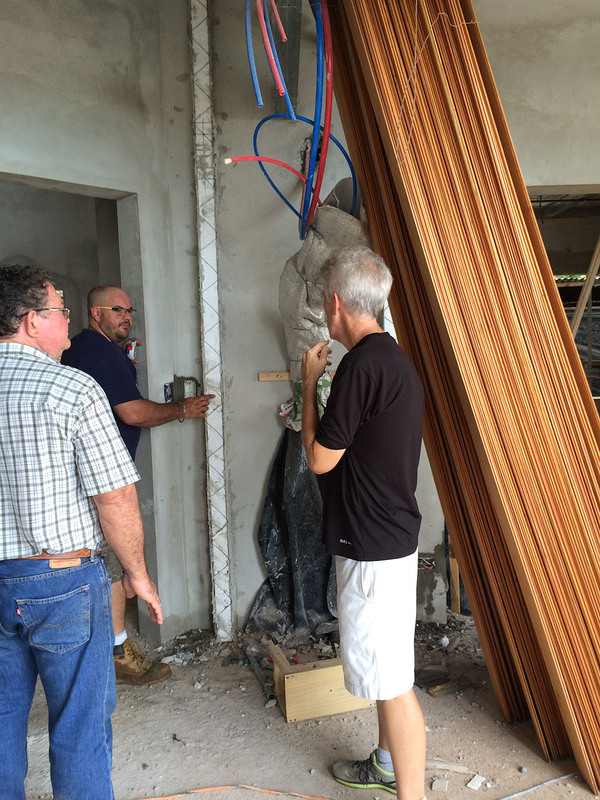 Eddie talking with cabinetmakers Caesar and Don Diego about some projects. 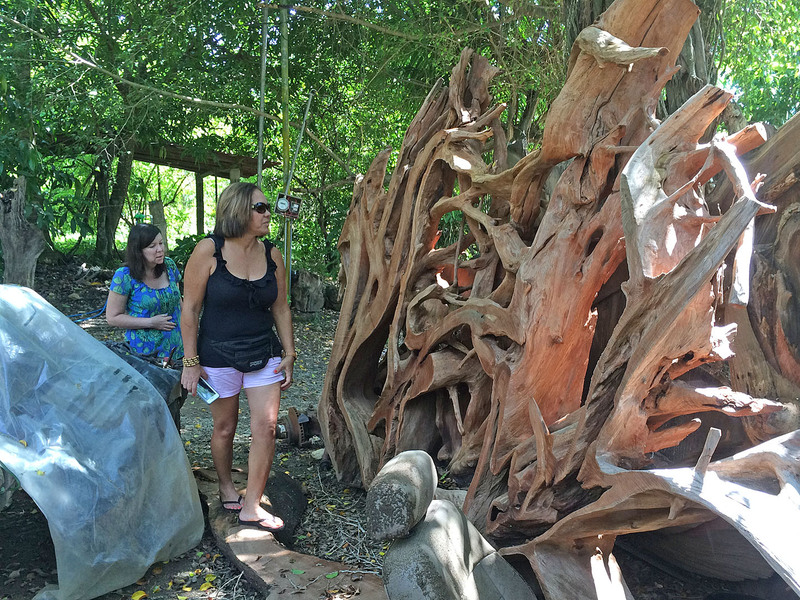 Mary Carmen and Tia looking at some of the wood pieces at Eugenio’s Woodworking. Ellen spotted a piece of Cristobal for a possible wall decoration. Last week, Eddie and I returned to Eugenio’s. His son Andres who speaks English and runs the shop for his father found a nice piece of wood for the shelf needed to hang the pendant lights over the bar in the kitchen. 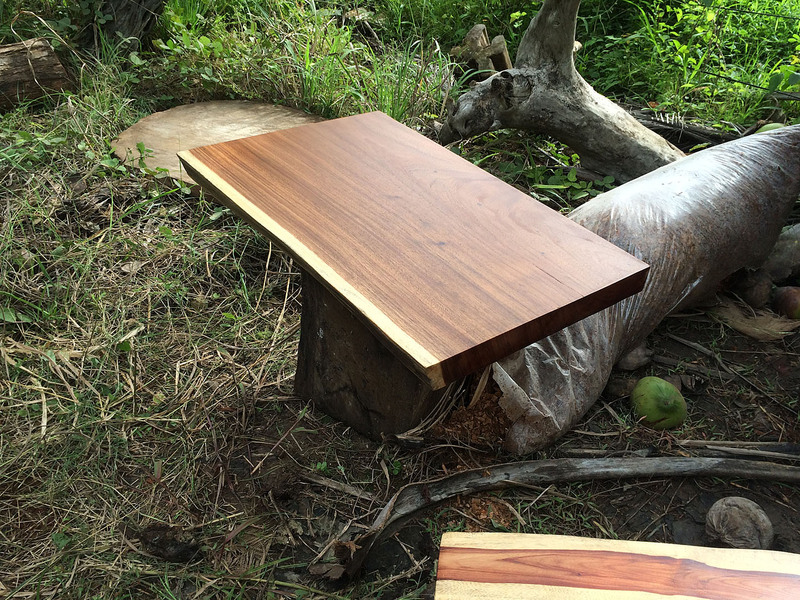 He also found a slab of wood that will work for one of the bathroom counters (the sink will sit on top of it). 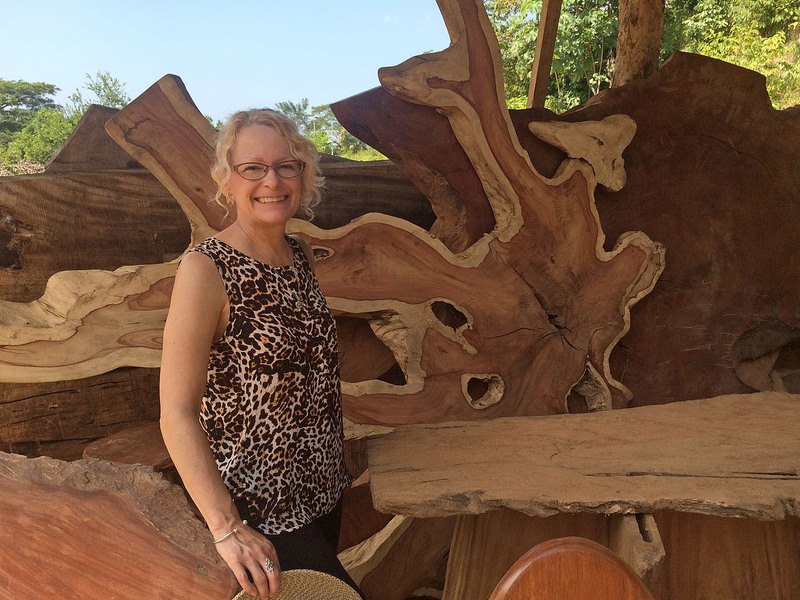 And, we bought the gorgeous piece of wood (cross section of the base of a 500 year old tree) that Tia and Mary Carmen suggested we hang on our big living room wall above the shelf. 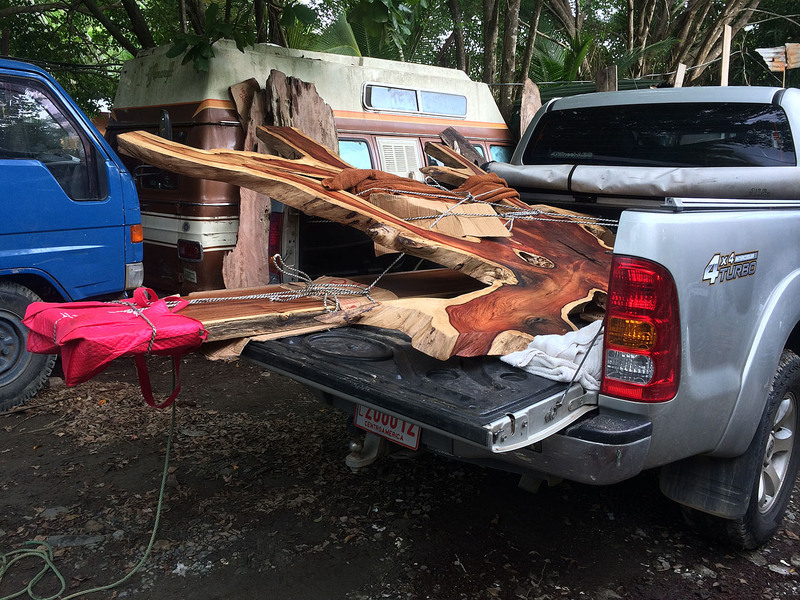 It took a few days to sand and varnish the wood, so we had to make another trip to pick it up. 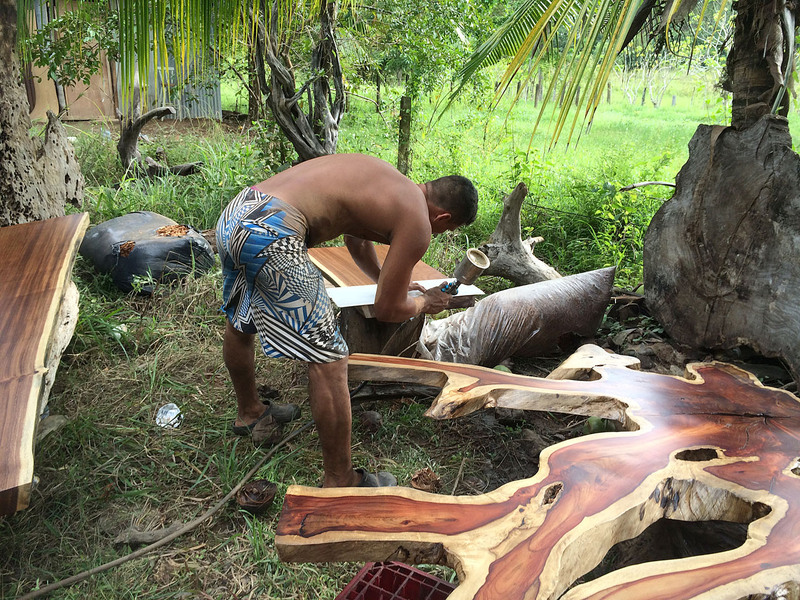 Another section of Eugenio’s wood shop. Andres putting the final touches on the bathroom counter top. This slab of Cenizero is ready for the bathroom counter. 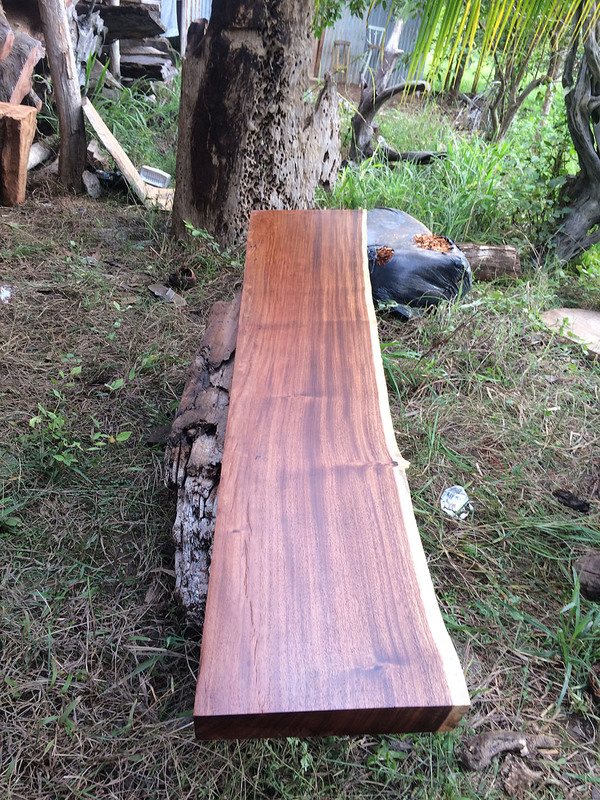 This slab will be the shelf above the kitchen bar (also from the same tree as the bathroom counter top). 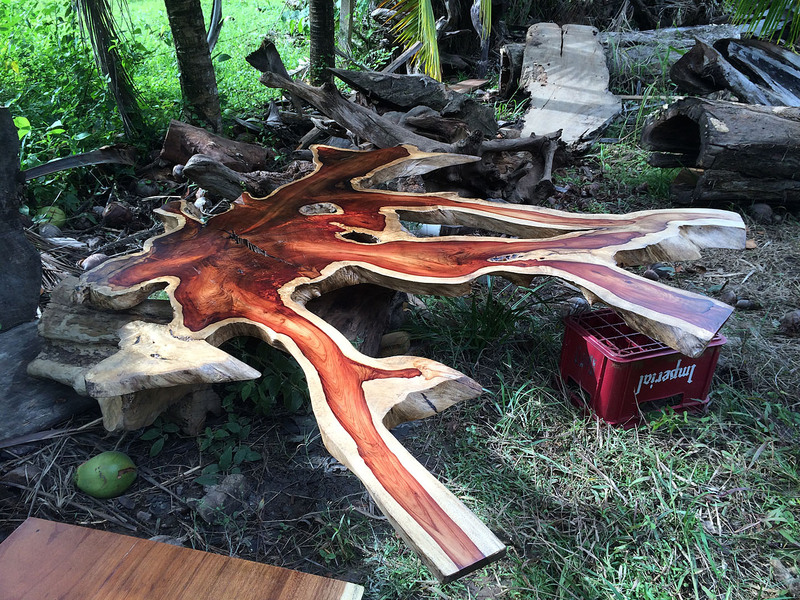 This is the cross section of the Cristobal tree which weighs about 200 lbs. We successfully loaded everything into the truck. 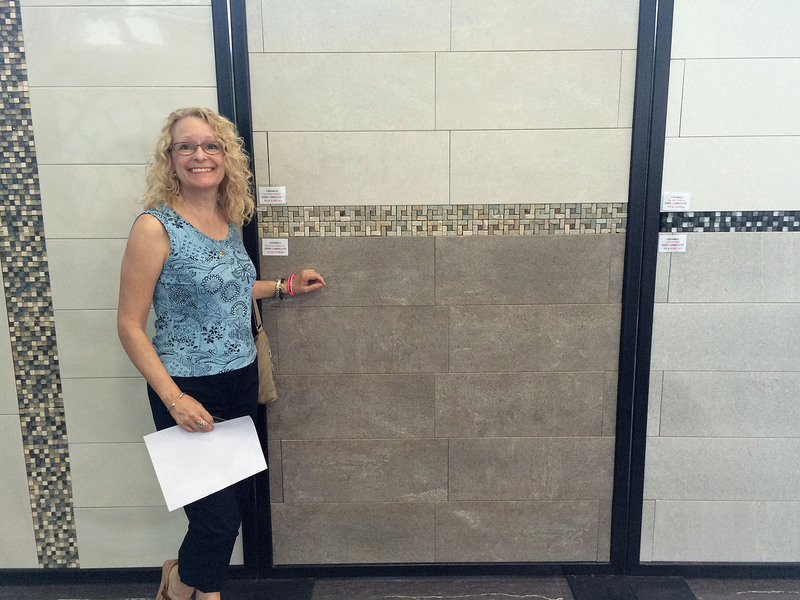 In addition, we have been shopping for tile for all of our bathrooms – for the floors, walls and showers. We spent hours in a store in Santa Ana (near San Jose) picking everything out. It wasn’t an easy task to pick out colors and style for everything at once. 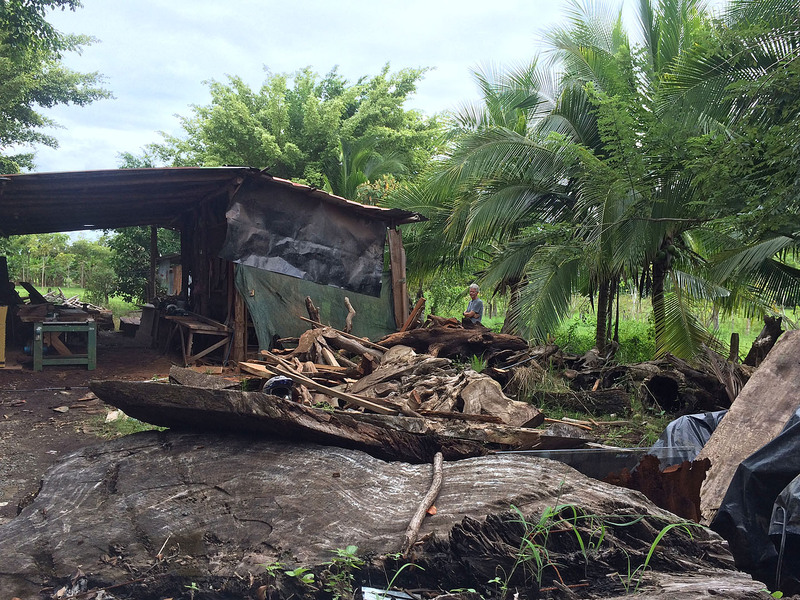 We wished that Tia and Mary Carmen could have been with us to help. 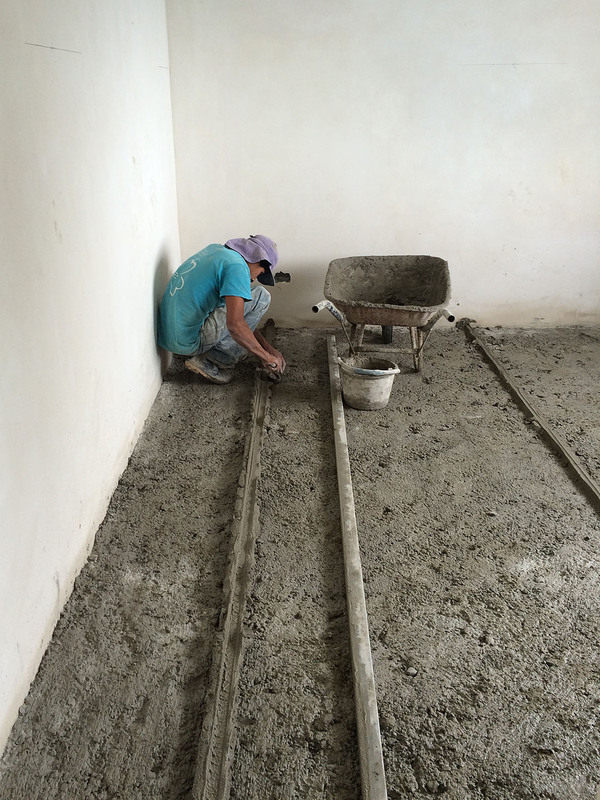 The house isn’t ready for the tile just yet, so it will be delivered beginning of December. It all added up to 4 tons! Ellen in front of the tile we are using in the master suite bathroom. 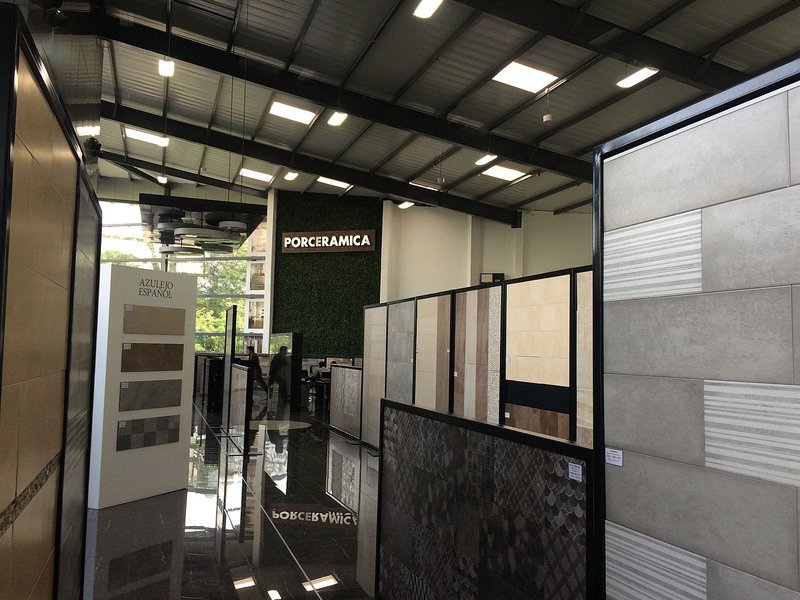 The tile showroom in Santa Ana where we found the tile for the bathrooms. 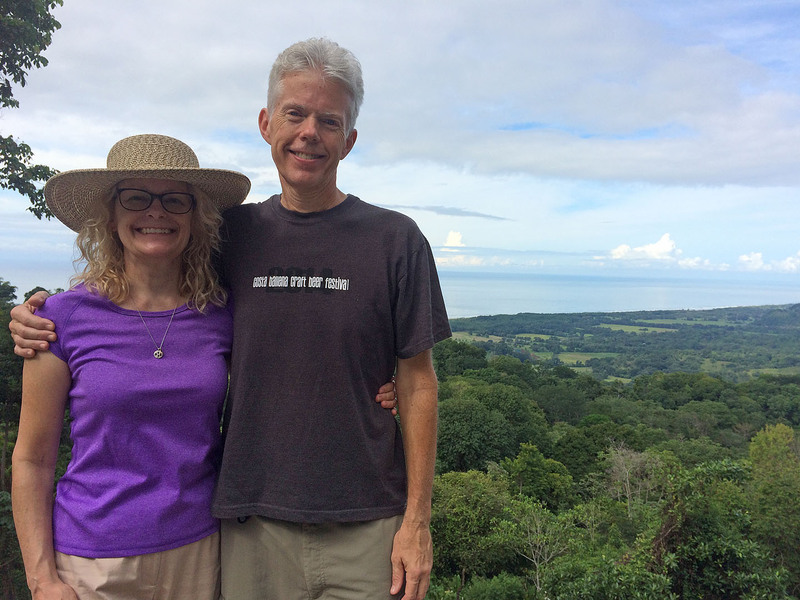 While in Santa Ana, we stopped at a place called Cerámica Las Palomas that our friend Chris told us about. We bought a painted sink there for the half bath. The one on display in the shop was too big, so a smaller one is being custom made for us. It should be ready in a few weeks. 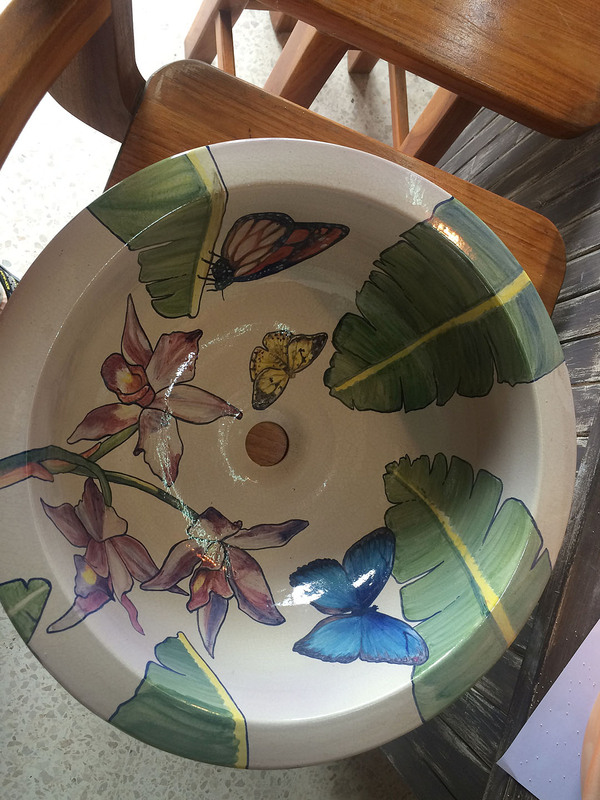 We liked this sink for the half bath. We are standing at the edge of the pool deck thinking about what it will be like when the house is all done. 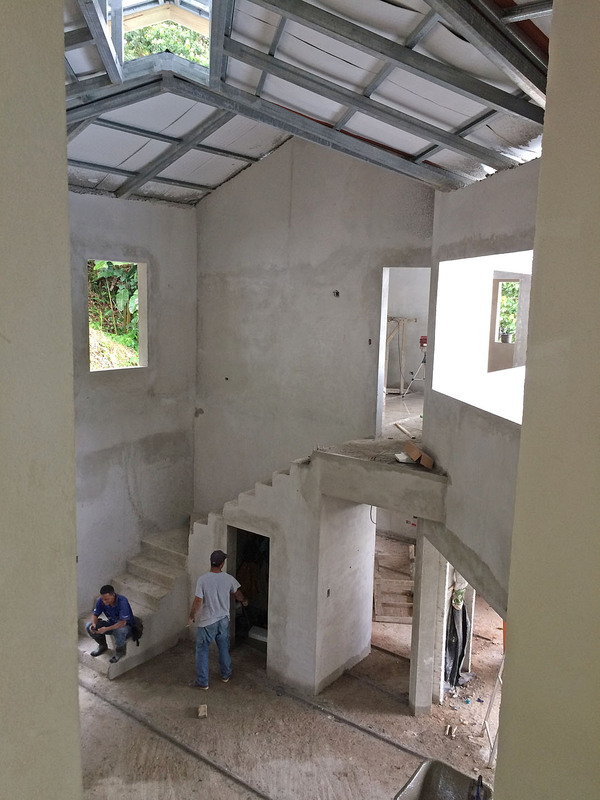 This entry was posted in Uncategorized and tagged building a house, Costa Rica, house building project. Bookmark the permalink. The build looks like it’s coming along nicely. The quality of the home matched with the beautiful location will make for a real dream home. It’s great keeping up with your blog post. The photos are so much fun and the descriptions bring it all to life. I am excited for you both!